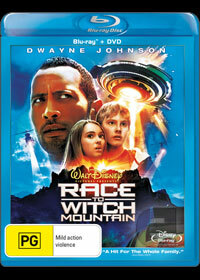 As the movie world revisits popular franchises such as Star Trek or horror movies, Disney have also decide to reboot one of their movies with Race to Witch Mountain and definitely goes beyond the original film. Starring the entertaining and powerful Dwayne "The Rock" Johnson, once a former wrestling star, he is actually quite suited to Hollywood and makes the perfect lead role for this science fiction movie. The story of Race to Witch Mountain revolves around this man helping two alien children from another planet. Unfortunately the military are also after these children, including an alien hunter from another planet which makes this the perfect science fiction formula for children of all ages. Best of all, the movie doesn't really take itself too seriously and really has a go on the whole "alien" phenomenon and conspiracies plus a healthy dose of humour from Johnson and some great performances by the all involved. Of course, the movie features some super stellar special effects that only makes the entire experience more entertaining and engaging. Apart from the thoroughly enjoyable story, Race to Witch Mountain looks quite stunning Blu-ray and could almost be considered a reference disc when it comes to quality. Matched with equally impressive sound, the 5.1 sounds brilliant through our LG speakers and in order to truly enjoy the film, it needs to be heard loud. Add in a DVD version of the movie and some great special features from deleted scenes, featurettes and a Blooper Reel to name a few and this nicely rounds out a well made and enjoyable film for the entire family!